Four years ago yesterday I started this blog, which means I am now officially into my fifth year of blogging. Once again the time has come to look back at the past year with my annual review to see what progress has been made on the blog. When I originally launched this blog I was rather optimistically planning to write one post per week. Over the intervening years however my posting frequency has dwindled to a rather dismal average of 1.25 posts per month (15 posts in the last twelve months). As part of my posting schedule I post a regular monthly podcast based on a podcast that I help to produce for Zen Internet. Seven of last year’s posts accounted for this podcast (it should have been 12, but unfortunately due to ill health I ended up stuck in bed for a number of months, which made recording the monthly podcast impossible). While I only posted 15 times in the last year compared to 18 times in the previous year, taking the podcast posts out of the equation I actually posted 8 main posts compared to 6 previously. An extra two posts may not sound much (33% increase), but the posts are always around 1,000 words in length and remain on the website ad infinitum hopefully drawing continuous traffic in the years to come. For a while I was concerned about my poor posting frequency, but I don’t want this blog to become a chore, or just end up churning out junk to keep up with some artificially self imposed blogging target. So I have resolved to just write posts when I feel I have something worthwhile to say, which will also hopefully be of some benefit to others too. This blog is powered by the ubiquitous WordPress blogging platform and Content Management System (CMS), which is based on the PHP scripting language and the MySQL database system. WordPress regularly releases security and enhancement updates, which I install religiously when available to ensure the maximum security and functionality of the blog. Since last year I haven’t made any significant changes to the blog and have only installed one additional plugin to the WordPress system, bringing its total plugin count to 25. While I may not be posting on a terribly regular basis, the blog continues to experience a steady growth in traffic year on year, undoubtedly due to its catalogue of old posts. The blog comments have almost doubled this last year, but while visitors have left more comments this extra increase is due in part to me responding to the majority of comments left, even if just to say thank you. Spam comments are the bane of any blog and as the blog grows, unfortunately so does the spam; the spam comments on this site have increased by 194% in the past year (the following graph shows spam comments on this blog for each month of the last year). Fortunately there are defences against spam, most of which was trapped by the blog’s Askimet and Conditional CAPTCHA plugins. While the blog’s spam level has increased by 194% compared to last year, it no longer seems to be growing as fast as it did and seems to have reached a steady level (for the moment as at least). 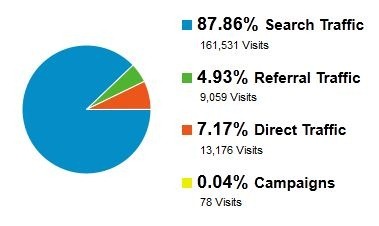 Like most people, I use Google’s free web analytics tool to monitor the website’s traffic and provide the majority of statistical information regarding the blog’s performance. 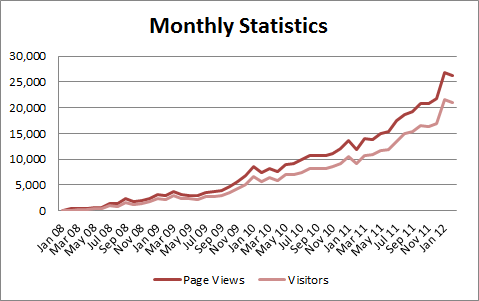 In the last year the blog had almost 184,000 visits and over 233,000 page views. The following graphs show the general rise in traffic over the past year. As in previous years the majority of the blog’s traffic (88%) was brought in via search engines, with Google dominating all traffic sources and particularly the search engine sources with its 96% of the search engine traffic, up from 75% last year! Direct traffic and referrals are up, but have remained fairly consistent throughout the year. This has effectively meant that the blog’s traffic has become even more reliant on Google; not such a good thing really. Judging by the countries of origin of my blog’s visitors (195 in total), I think it’s fair to say that the blog has universal appeal. This year the blog also received visitors from an additional 17 countries. 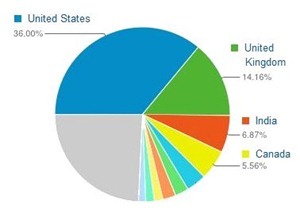 The United States and the United Kingdom remain the top visiting countries with 50% of the blog’s overall traffic; 36% of visitors come from the US and 14% from the UK. The blog’s RSS feed is supplied via Google’s FeedBurner service as this service provides a range of statistics about the website’s subscribers and offers an e-mail subscription version for people that aren’t familiar or comfortable with RSS feeds. Currently the feed has 69 subscribers (22 of which subscribe by e-mail). This is a significant decrease over last year’s total of 119 subscribers. The following graph of RSS subscribers over the history of the blog shows Feedburner’s often erratic reporting where hosts of subscribers mysteriously disappear only to suddenly reappear. However, on 25 July 2011 the subscriber figures dropped from 125 subscribers to 50 overnight, never to return! 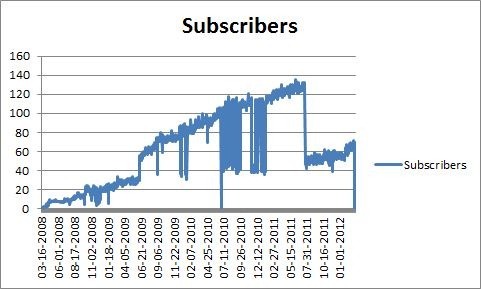 The subscriber figures have continued to grow over the past year since this event, showing a general upward trend. This massive overall drop in numbers is most likely due to a change in how Feedburner report their figures. While the year on year figures don’t appear positive, the graph does show a consistent growth rate, so I’m not overly worried. The website’s most popular post by far is still Embedding Album Art in MP3 Files, receiving 60% of the blog’s entire traffic. Thank you to everyone that has subscribed to the blog and to those that follow it regularly. Thanks ever so much for your continued support, it makes everything worthwhile. …and if you haven’t subscribed, why not subscribe now to get the latest updates. You don’t need to worry about my posts clogging up your in-box as I don’t post that regularly, but hopefully you’ll find something of interest and value when I do get around to posting. Are Desktop Blogging Clients Worthwhile? RSS Feeds: Full Fat or Semi-skimmed? 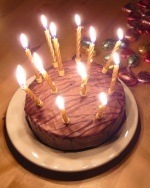 Blog Hits the Terrible Twos Happy Birthday Blog: Three Today!